Fresh off an unbelievable 2017 campaign that saw Richmond break a 37-year premiership drought, the Tigers were widely picked to go back-to-back after an even stronger year on the field last season. Damien Hardwick’s men went to the top of the ladder after Round 13, a position they would not relinquish on their march to their ninth minor premiership in club history. A strong victory over Hawthorn in the qualifying final set up a monster preliminary final clash with Collingwood, a team the Tigers beat on two occasions during the home-and-away season. However, a first-half blitz from the Magpies blew Richmond off the park, with the Tigers unable to claw their way back from a 44-point half time deficit. In a year in which he claimed his third Coleman Medal and All Australian honours, Jack Riewoldt added a second Jack Dyer Medal to his impressive resume, with Kane Lambert and Dustin Martin rounding out the top three. Following Ben Griffiths retirement last January to pursue a career in the NFL, the Tigers also bid farewell to Shaun Hampson after succumbing to a chronic back injury. Following their disappointing end to the season, premiership forward Jacob Townsend, Mabior Chol and Nathan Drummond were all delisted, although Townsend and Chol were given rookie lifelines. 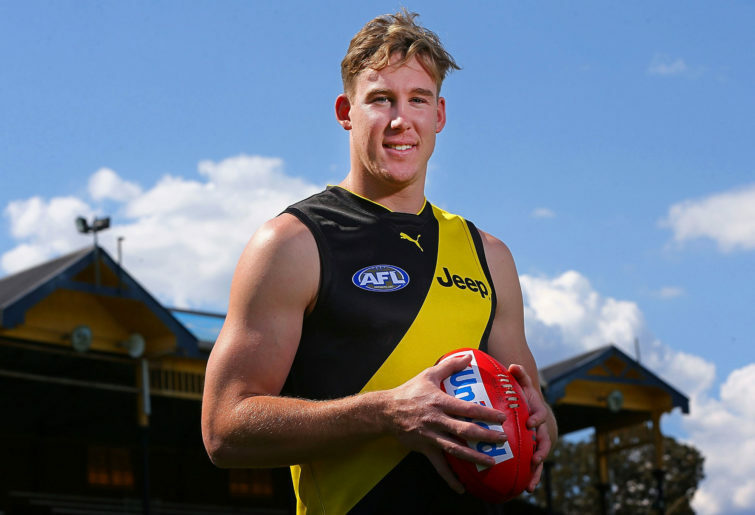 The Tigers were a major player in the free agency period, with Reece Conca signing with the Fremantle Dockers after 104 games in the yellow and black. After a year of fierce speculation, out-of-contract Gold Coast co-captain Tom Lynch announced his desire to leave the Suns. With Richmond, Hawthorn and Collingwood all in a race to secure the signature of the gun key forward, it was the Tigers who Lynch announced as his preferred home. As a result, the compensation pick Richmond received for the loss of Conca was withdrawn after the signing of Lynch. Having struggled for senior opportunities over the past two seasons, Corey Ellis and Anthony Miles both requested trades away from the club, with Gold Coast landing the duo in a package deal, along with Richmond’s future third pick, in exchange for the Suns’ future third selection. Depth forwards Sam Lloyd and Tyson Stengle were also traded, Lloyd leaving to the Western Bulldogs for pick 64, while Stengle landed at the Adelaide Crows in exchange for selection 68. With their first-round draft pick coming in at selection 20, the Tigers picked up talented inside midfielder Riley Collier-Dawkins from the Oakleigh Chargers, before fellow Oakleigh product Jack Ross joined the club via selection 43. Tasmanian Fraser Turner was drafted to the Tigers at pick 58, before Luke English from Perth joined at selection 62. With Callum Moore upgraded to the senior list, the Tigers added VFL player Jake Aarts to their rookie list, as well as selecting delisted duo Townsend and Chol. As per the new supplemental selection period introduced by the AFL, the Tigers also signed former St Kilda forward Maverick Weller to their rookie list. Arguably the face of Richmond’s 2017 premiership given his on-stage antics with The Killers at the grand final afterparty, Jack Riewoldt did everything he could to take the Tigers back to the grandest stage of all last year. The club vice-captain had arguably his best-ever year at the age of 29, claiming his third Coleman Medal with 70 goals while averaging 14.2 possessions and 6.2 marks. Riewoldt also produced one of the best individual performances of the season, collecting 26 touches, hauling in 14 grabs and booting ten goals from 16 scoring shots against Gold Coast in Round 21. It was this match that propelled Riewoldt to the top of the goalkicking table, also helping him clinch a third All Australian selection, while he also received the Jack Dyer Medal for the second time in his career. With the arrival of Tom Lynch in 2019, it will allow Riewoldt to spend more time roaming up the field, where his strong contested marking and great kicking ability will benefit the team. The strength of the Richmond line-up over the past two seasons has seen a number of quality players struggle to maintain their position in the best 22, with durable midfielder Brandon Ellis a casualty last year. After a subpar opening month to the season, Ellis’ streak of 111 AFL games was broken, with the 25-year-old dropped back to the VFL. He returned in Round 10, playing out the remainder of the home-and-away season before being dropped on the eve of the finals. Ellis, who is due to become a restricted free agent at the end of 2019, will be hoping to have a strong start to the season to re-assert himself as a member of Damien Hardwick’s best side. One of the highest-rated prospects in his draft year, it didn’t seem fair when Jack Higgins slid to Richmond’s first pick at selection 17 following their grand final triumph over Adelaide. The talented goalsneak earned a debut in Round 3, winning the hearts of football followers around the nation with his bubbly personality. It wasn’t just his exuberance that impressed though, with Higgins showing just how talented he was with seven goals in his first three matches. 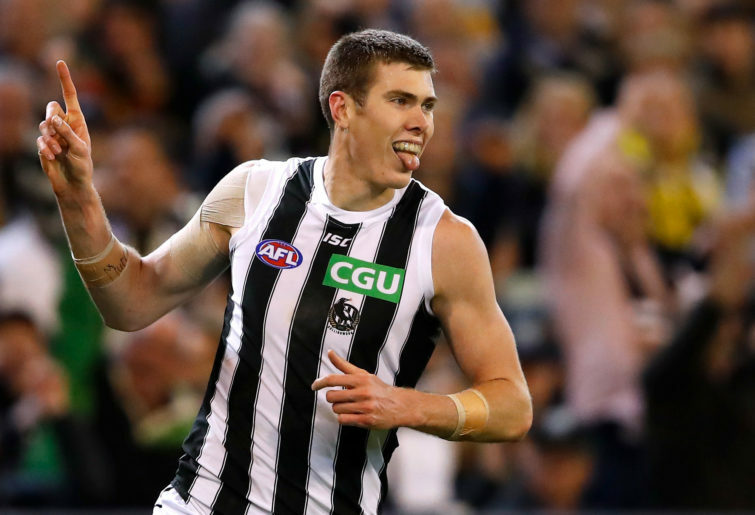 The 177cm Higgins played 20 matches in his first year, providing arguably the highlight of the season with an incredible goal against Collingwood in Round 19 that saw him win the Goal of the Year award. Higgins will be desperate to avoid the dreaded ‘second-year blues’, and if he can, watch him start impacting games even more so. In a whirlwind 12 months, Jacob Townsend went from unlikely premiership hero to demotion to the rookie list. The former Giant, who kicked 16 goals in the final five matches of 2017, struggled to maintain that incredible form last year, booting 12 majors from ten matches, with only two games coming after the mid-season bye. Richmond are spoilt for choice when it comes to quality small forwards, so Townsend has his work cut out for him. Also under pressure to perform in 2019 is quick midfielder Connor Menadue, who has managed just 33 games in his four seasons on the Richmond list so far. Due to come out of contract at the end of this year, the 22-year-old will have to make his opportunities count to convince Damien Hardwick that he is worth persisting with. After 254 goals in 131 games with the Gold Coast Suns since his debut in 2011, Tom Lynch confirmed one of footy’s worst-kept secrets late last season, announcing that he would be departing the club via free agency. With a number of high-profile clubs lining up for the Victorian-born key forward, it was Richmond who won out, beating the likes of Hawthorn and Collingwood to sign the 26-year-old for seven years. The former Suns’ co-captain will be under immense external pressure to perform given his hefty contract and will be eager to get back to his best football after a couple of injury-riddled years. How he fits in three-time Coleman Medallist Riewoldt will be one of the more intriguing storylines of 2019. Another ex-Sun joining the Tigers for the 2019 season is Maverick Weller. The Tasmanian-born forward, who started his career at Gold Coast before playing 89 matches at St Kilda, was signed by Richmond under the AFL’s new pre-season supplemental selection period following his delisting at the Saints. Weller arrives at the Tigers with great leadership qualities and a knack for finding the goals and, given his experience, will provide very handy list depth, something Richmond lost during the trade period. Having snagged the slider of the 2017 draft in Jack Higgins, Richmond couldn’t believe their luck when Oakleigh Chargers midfielder Riley Collier-Dawkins landed in their lap at selection 20. A fierce inside midfielder, Collier-Dawkins has grown considerably in the past two seasons, now standing above 190cm. The 18-year-old hunts the ball with determination and can either use his great vision to distribute the ball, or he can power out of stoppages and use his long kicking to penetrate the attacking 50. Given his recent growth spurt, Collier-Dawkins is also adept in the air, giving him a point of difference over most midfielders. 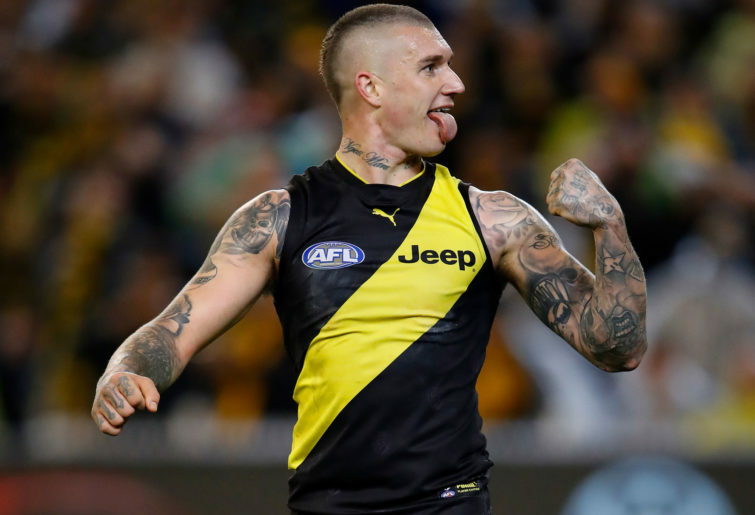 Fresh off one of the most dominant seasons by an individual player in recent memory, Dustin Martin couldn’t quite reach the lofty heights he set in 2017, with his Supercoach average dropping from 119.3 points per game to 103.9. Still, ‘Dusty’ has the ability to tear games apart with his dynamic playing style, and with 68 goals from the past two seasons, Martin can pile on the points when resting forward. An absolute must-have. Dustin Martin of the Tigers. Despite finishing the season on top of the ladder, Richmond have been handed the sixth-easiest fixture as rated by Champion Data. The Tigers’ season-opening clash with Carlton will be the first of two match-ups against the competition cellar dwellers, with return matches also scheduled against Port Adelaide, Collingwood, Melbourne and the GWS Giants. Richmond will feature prominently in the prime time slots in 2019, with three matches on both Thursday and Friday nights, as well as a Wednesday night meeting with the Demons on Anzac Day Eve, which the Tigers will host. Richmond will play two matches at the Adelaide Oval, with interstate trips to face Fremantle, Gold Coast and the Giants. From their remaining 17 games, 13 of those are scheduled at their MCG fortress, with four across town under the roof at Marvel Stadium. Nothing jumps out at me from Richmond’s 2019 fixture, so I will resort to a completely inane and pointless observation: the Tigers’ clash with Melbourne in Round 20 will be the first Saturday night meeting between the two sides since Round 8, 2003. In a bumper first six weeks of the season, the Tigers will feature prominently in some massive games. Of course, the season opener is always a must-watch, even if it will be between two sides who bookended the 2018 ladder. All things going to plan, it will be Tom Lynch’s first appearance in the yellow and black, while a week later, a huge Thursday night game against Collingwood will deliver a crowd close to 90,000. In a rematch of last year’s preliminary final which saw the Magpies claim a famous underdog victory, the Tigers will be desperate to atone. Round 5’s Saturday night match against the Sydney Swans will also see Alex Rance and Lance Franklin go head-to-head, which is worth the price of admission alone. A special Wednesday night fixture against Melbourne on Anzac Day Eve a few days later will be a gripping encounter between the two vanquished preliminary finalists of last season. Nothing will intimidate Richmond too much with their fixture, however, a Thursday night encounter with the Adelaide Crows in South Australia in Round 13 will be a tough match to navigate for Damien Hardwick. The Tigers have lost their last three matches to the Crows at the Adelaide Oval by an average of 49 points, and with concerns over Richmond’s ability to play well interstate (one win from five matches in 2018), this will be one game the critics will be tuning in to watch. Bowing out of last year’s preliminary final after such a convincing home-and-away campaign was nothing short of a disaster for the Tigers, who missed a golden opportunity to win back-to-back flags. A major advantage Richmond has over most sides is just how settled their line-up is. In fact, the 22 players that the Tigers took into their 2017 grand final victory over Adelaide still remain on the list. Losing Reece Conca, Sam Lloyd, Corey Ellis, Anthony Miles and Tyson Stengle has hurt Richmond’s depth, so it will be interesting to see what happens if the Tigers are hit by injury, something they have been quite lucky within the past two years. Still, I’m tipping a grand final finish for Trent Cotchin’s men who, while I expect some initial teething issues, should benefit greatly by the addition of Tom Lynch up forward. Predicted finish: 1st – 2nd.